The stairs leading up to the Museu Nacional d`Art Catalunya, in Barcelona, were packed with people. People were sitting close to each other on every inch of the long steps leaving only a narrow path for others to climb the stairs. The warm air was full of excited expectations as people were chatting in many different languages. 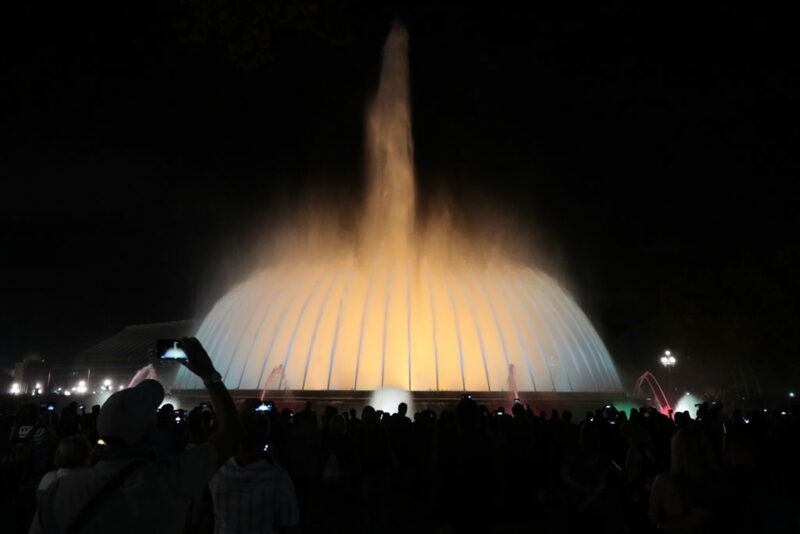 The benches around the fountain became occupied almost 2 hours before the show started. The snack bars were busy serving food and drinks as the evening was slowly chasing the daylight away. We had a picnic and then positioned ourselves on a low wall, where Jacint set up the camera and where we then spent the next few hours. Vendors were approaching people who were waiting around the fountain; they were selling cold beer, bottled water, some of them specialized on sangria. Other vendors spread out a variety of scarves or souvenirs on the pavement. Before we occupied the place on the narrow wall, we spent the day with sightseeing. 11 years ago we spent a couple of days in Barcelona and now we re-visited some of the places with nostalgia. It seemed that there were a lot more tourists in the city now, than 11 years ago. The cafes and restaurants were full at any time of the day. Umbrella held up high, guides shepherded tourist groups in the Gothic Quarter and on La Rambla. And I it seemed to be a lot more vendors now. I remember after darkness fell, some people were selling the small blue plastic sticks with flickering lights by the fountain. And the few snack bars near the fountain were operating back then as well, but there weren`t any vendors walking around with cans of beers and water. Like clockwork the water started to flow at 9pm and then a few minutes later the lights came on. 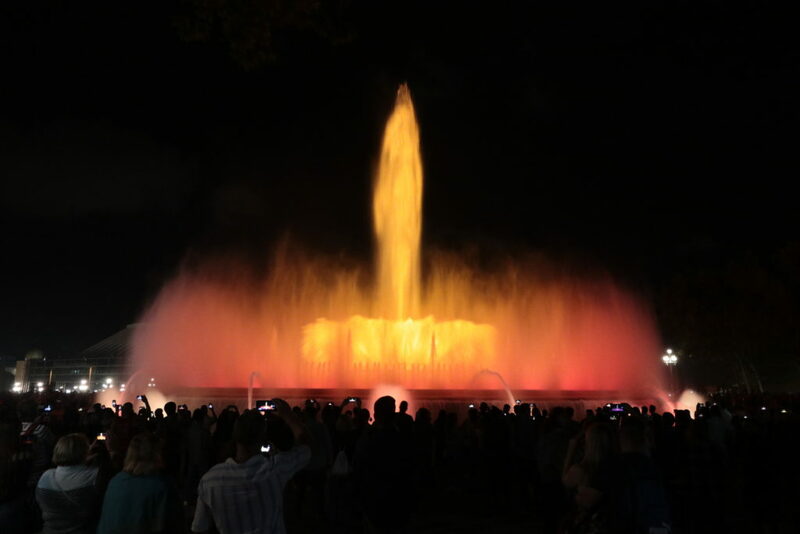 People cheered and pointed their phones to the fountain as the show started. Jets of water danced to the music. The water shot high and then fall like a huge curtain before spraying in a completely different angle. 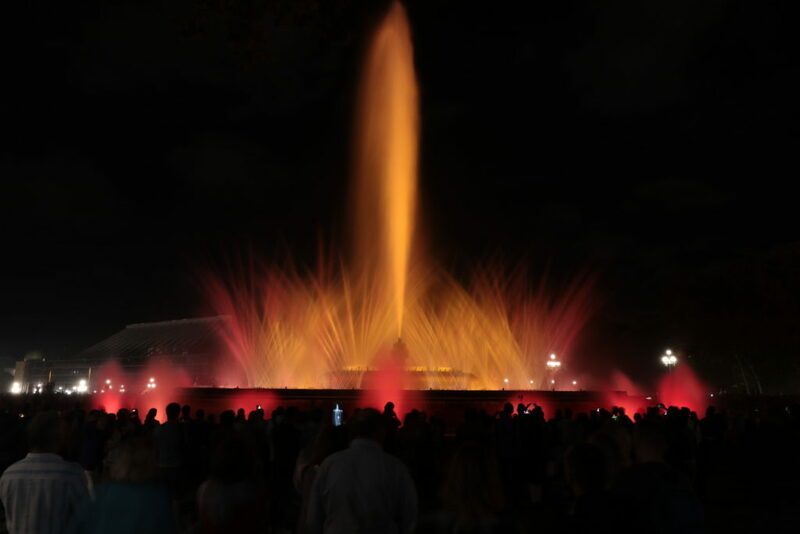 The illuminated fountain bathed in red, pink, yellow, white, green and blue. It is often reminded me a fire work display. We watched the hour long show and only left when the lights went off and the flow of water stopped. We took a crowded tube then left the busy city behind. The following day found us in the peaceful mountains without vendors, and without group of tourists.